Bowjangles are a string quartet who can really play. They dance whilst they play. They sing whilst they play. They can do it all and this is their most magical, and ludicrous, show so far. A theatrical, musical journey through myths, folklore, legends and a portal in a cello case in the quest to find the most priceless relic of all; a magical violin bow know as Excalibow. You can expect tales of ancient gods, monsters, historical figures and characters of pure fantasy in this action packed show, all presented in Bowjangles own inimitable and unique style. Full of comedy, energy, panache and almost every musical genre you can imagine. Suitable for all ages. Be warned, may contain traces of Abba. 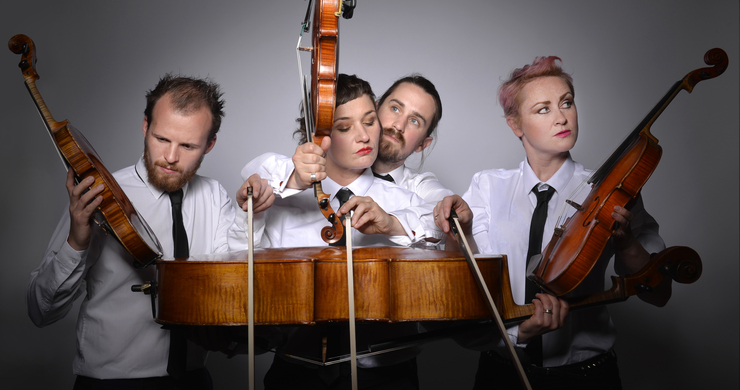 Bowjangles are four very clever and funny performers, not to mention truly excellent musicians. This is a cabaret comedy night of pure fun that is always a big hit on the rural touring circuit.